BARRETT STATION  An elderly, bedridden woman was trapped within a house on fire on Blanchard St. on Friday, Feb. 20. Area communities have much to be proud of due to the responses of Crosby Volunteer Fire Dept., ESD#5, Highlands Volunteer Fire Dept. Sheldon Fire Dept., and Channelview Fire Dept. About 60 seconds after the woman was being treated by medics outside the house, the structure collapsed, exactly where she and firefighters from Crosby and Sheldon had just been. The potentially deadlly situation was called in to 911 Dispatch that Friday at 12:29 p.m. According to Crosby VFD, the fire had started in the garage and spread quickly throughout the home. 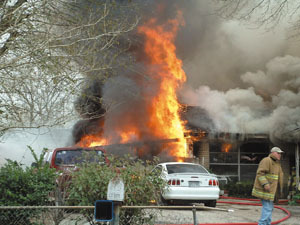 All entrances were engulfed in flame when Crosby VFD and ESD#5 arrived and took charge of the scene. The 85 year old woman was trapped inside a front bedroom, with only a narrow window for escape. Flames came out of the roof as two fire fighters volunteered to enter that narrow opening. Justin Reed of Crosby VFD and an unidentified member of Sheldon Fire Dept. breached the narrow opening and searched to find the woman in the dense smoke- filled inferno. According to Justin Reed, It was so smoky, I couldnt see the woman, I had to feel around for her, let alone be aware of who was assisting. It took both mens utmost strength to hoist the woman (weighting between 200 to 300 lbs.) up to the window and the efforts of several emergency rescue workers on the outside to lift her through the window to safety. Concern now was for Reed and the Sheldon fire fighter still inside. With herculean effort the two escaped the flames. Reed was injured by glass while lifting the woman through the bedroom window and received eight stitches to his hand. ESD#5 Medics worked on the woman next preparing her for transport. Compliments from the Memorial staff were extended to paramedics for a job well done in life-sustaining efforts, because she had inhaled dangerous amounts of smoke. A LifeFlight helicopter flew the woman to Hermann Memorial Hospital where she was treated for smoke inhalation, and was reported in good condition after the harrowing ordeal. Reed was praised for his heroic efforts by other firefighters on the scene. CROSBY  The greater Crosby community lost a friend, booster, and leader unexpectedly early Tuesday morning. The hardest thing to write is an obituary for a best friend. The greater local areas and perhaps the nation had a best friend go the greatest reward on Tuesday morning, February 24. Thomas Hugh Tommy Latta Jr., 52, of Crosby went to be with our Lord Tuesday, Feb. 24. He was born May 21, 1951 in Orange, Texas to Thomas Latta Sr. and Mary Ann Latta. The warmth and character that he generously gave to those in need, and stood for in numerous voluntary capacities will surely be missed. If a situation seemed intractable or futile, it was Tommys gift to begin an alternative approach with a gentle teasing of the frustrated follower and apply a wonderful sense of humor that shed a new light. His faith, ability and willingness to take action made him undefeated. It is fitting that his son, Shawn Latta, presented Tommy with Volunteer of the Year at the Crosby/Huffman Chamber of Commerce Banquet last Friday night, before a crowd of hundreds of admirers. As Shawn presented his oration to Tommys numerous friends, not only was there few dry eyes in the assembly but each of us came to understand the fullness of wisdom and shepherds guidance Tommy bestowed upon his family. My choice for Volunteer of the Year Every Year, began the speech, and perhaps those of us that knew him will ever think of him in that way. But for his friends and loved ones it is far more likely that we will remember as a humorist, leader by example and benevolent influence to the community. It is fitting that he was able to support his son as his son spoke for the gratitude of those of us that came to know him. He is survived by his loving wife of 30 plus years: Mary Latta of Crosby, Baytown P.D. Officer Shawn Latta and Shawns wife, Nikki, of Crosby. His parents, Thomas Latta Sr. of Kirbyville, TX, brother, Jimmy Latta of Bridge City, TX survive. His grandson, Caleb Latta of Crosby, is a survivor that brought Tommy profound joy in his later days. Many nieces, nephews, other relatives and friends survive him. His grandparents Hugh and Vivian Latta precede Tommy in death. Tommy owned and operated Senor Smoke in Crosby and Dayton; prior to founding those stores he was in law enforcement. He was Assistant Chief in Orange County Sheriffs Dept. before he retired from the post. He enjoyed playing golf, going for tea at Hectors and Saturday and Sunday breakfast with friends. Tommy was involved in many different community functions and served on the boards of directors, these include: Crosby Fair & Rodeo, Crosby/Huffman Chamber of Commerce, and ESD#5 (Crosbys ambulance service.) Tommy not only helped mold a modern ambulance service, he also rode in the ambulance as volunteer, and was constantly learning about the service to enable its betterment. Tommy was a member of the Crosby American Legion and Commander of the Crosby Veterans of Foreign Wars. Funeral services will be 10:00 a.m. Saturday, Feb. 28 at the Crosby Fair and Rodeo Rockin C Arena with the Rev. Dr. Larry Koslovsky officiating. Burial will follow at White Cemetery in Highlands. Visitation will be Friday, Feb. 27 from 5:00 to 9:00 p.m. at Sterling White Chapel. Arrangements are entrusted to Sterling White Chapel, 11011 Crosby-Lynchburg Rd., Highlands, Tx 77562, phone (281) 426-3555. Tommy was glad they served breakfast on Saturdays. How else would we know about the really important things in this world told by experienced schoolmen of the world? I watched the interaction, on many mornings, as a group of Saturday friends met over breakfast at Hectors. Tommy made this port of call almost every Saturday. He had a way with people that settled you and made you feel like you were important. It was a skill he cultivated from his soul. Nothing could have taught him better than the experiences of a life well led where respecting people was the hallmark. Often I would talk to him on the way in or out. In the fall I could always count on football stories. You see, Tommy Latta did many wonderful things and one of those was calling football games in the golden triangle. Where ja call Tommy? There was always a cogent story that followed that ended up with him explaining a rule to me, or telling me what a good guy some coach was, or talking about whether his knees would finally give out on the field. Large schools, small schools, it didnt make Tommy any difference. It was just one of the lives he led. Lately, I noticed the EMS around him. I served on the ESD Board in its founding days and now Tommy was at the heart of their operation as a Board Member. He would keep me up to date. I watched him drink coffee with the EMS techs and knew this, also, was a part of his life. Tommy Latta was a special man who had remarkable insight into not only events of the time, but into himself also. He was a person of many passions who was never consumed by himself. He was a person who tried to look at a lot of points of view, and succeeded. I feel fortunate to have known Tommy and to have had my life åtouched by his. Words do not exist to tell everyone how much he meant to so many people. Typical of Tommy was when Shawn Latta was introducing him at the Chamber banquet just a day or so before he passed. Shawn was full of emotion and before long you saw Tommy creeping toward the podium to help his son. No one picture of a persons life could have been more clear than Tommy helping a family member through something. Some of us have remarkable moments. Tommy had a remarkable life, every day. Touching all of us in countless ways. I was not even on the radar in terms of being one of Tommys inner-circle, but it was enough just to have contact occasionally. Everyone always says how someone will be missed. Often, that is a temporary thought and we go on to the next point in life. Tommy will actually, truly, for real, always be missed. He was one of a kind. I just wish he could have finished explaining defensive holding to me, or maybe more about how to live a good life. We attended funeral services for the Mrs Father yesterday. R. I. P. Don McAninch, my pa-in-law. On the date of his death, our twin was in flight from Pennsylvania to Texas bringing his wife and 7 month old son. The twin was bringing him to Texas to see his grandfather before he passed away but there just was not enough time. The little fellow was introduced to him anyway. The funeral home had the immediate family off to the side and up front. I kept staring at the high dollar wooden box that he was going to be cremated in and simply shook my head. My mind wandered and the preacher man came out and said words that would make you think he knew the deceased. As Amazing Grace was played in a soulful version, I whispered to the Mrs. that he would rather hear Eddy Arnold. She smiled. The twins sat in the row behind us during services and of course the 7 month old was directly behind me. Hed jabber on occasion and make baby sounds. About midway through services I heard a grunt and another fine grunt indeed. Sure enough during his great grandfathers funeral service he allowed nature to do its thing. His grandfather smiled and wiped his eye. The Mrs. said her Dad would have found that funny. In talking to Dons brother during visitation, I mentioned that he sure didnt like me when I first married Rosetta because we eloped. That did bring a smile on his face and he agreed, telling me that he had discussed that with him before; it just took time for him to come around. Driving back to the house on Goose Creek I asked the Mrs. about funeral services for us as we have talked of this previously and she reiterated the fact that she does not want any visitation or services. None, nare bit. You got your plans made up for when you kick the bucket? It is a true eye opener indeed at the cost of a funeral service. Why even to run an obituary piece in the big city paper for one day cost $450.00  well, when you have lots of family to mention. Heard of a court case once involving a tall person that was to be buried. During visitation the relatives wondered how the funeral home got the long body in the casket. Come to find out the funeral home had cut the persons legs off to make the body fit. It ended in a lawsuit of course. EAST HARRIS COUNTY- Forget about the primaries, an election process which has a direct impact on the residents of Crosby, Huffman and McNair has now begun. Filing began last week for the Crosby, Huffman and Goose Creek CISD Board of Trustees elections. The election will be held May 15, with early voting beginning on March 16 and lasting through May 11. Each district will have two seats up for election this year. In Huffman, positions 4 and 5 are on the ballot. Currently, these seats are being held by Pat Buzbee and Kent Hjerpe. As of press time the only candidate to have filed for a place on the ballot is Charles Mason for Position 4. Both of these seats are at-large positions so all voters whithin HISD boundaries can vote. Crosby has two single-member districts on the ballot. These are Positions 3 and 4 currently held by Lindy Murff and Sheryl Shaw respectively. Position 3 covers the eastern quadrant of the school district, from FM 2100 east to Cedar Bayou and the Liberty County line near Huffman. Position 4 voters are those living in the western parts of Newport, closest to the river with the exception of Section 10. As of presstime only Shaw has filed for the election. During the election, only those living in the specific districts can vote. In Baytown, Districts 1 and 4 are on the ballot. These are held by Phletria Barnes and Dr. James Lewis. District 1 covers the western part of Baytown, primarily the McNair sections north and south of I-10 and extending to the area around Pumphrey Elementary. District 4 in located in Central Baytown. Carl Burg is sole candidate to date. He is running in District 4. The deadline to file for a spot on either of the three ballots is March 15 at 5 p.m. If a district has no contested races at that time they can, under state law, cancel the election and declare the candidate winner by default. Nationally known Supercross Racers, who were in Houston to compete in Reliant Stadium, stopped in Highlands on Friday to sign autographs for fans at the Tejas Motorsports Shop. Seen above are David Vuillemin and Chad Reed. Also scheduled to be present were nationally known Tim Ferry, Ezra Lusk, Heath Voss, Mike Brown, Kelly Smith, and Danny Smith. All are members of the Yamaha Factory Racing Team. 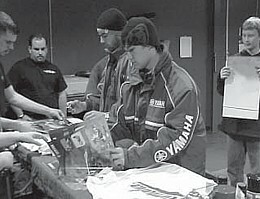 Tejas Motorsports hosted the event, which included a display of Supercross Bikes, and Refreshments and Door Prizes. CROSBY  When a local man became reported missing on Feb. 8, detectives began to investigate and a mounted volunteer force came to town to the rescue or find out what happened. Mystery surrounds the disappearance of Tyrin Arcenaux, Monday, Feb. 9, at 4:00 a.m. his car was found on U.S. 90. His family had reported him missing on Sunday. Harris County Sheriffs Detectives, Marine Division, and Texas EquuSearchMounted Search and Recovery Team have combed the vicinity and waterways where the car was discovered, but as yet there is no rescue or recovery. On Sunday, Feb. 14, Texas EquuiSearch was back dragging under the Beaumont Highway in hopes of locating a body. As of Tuesday, nothing has been found and hope is waning of finding him. The Harris County Marine Division told Homicide Detectives that the 50º temperature of the San Jacinto River would indicate several days would have to pass before a body would float to the surface, and then possibly miles downstream from where it entered the water. Homicide Detectives indicate that thus far they have found indications that Arceneaux may have been involved with drugs but declined further comment as they have found no evidence that foul play was involved with the disappearance. CROSBY  If the Crosby ISD Board of Trustees and the Texas Education Agency give their blessings, students will have two less days of instruction in the upcoming school year. The district is seeking waivers from the state which would allow them to begin the fall semester two days earlier and to reduce the number of instruction from the state mandated 180 days to 178 days. Dr. Don Hendrix, superintendent of the district, said that when the calendar committee made the recommendation for 2004-2005 they asked for two days less of instruction for students. These two days, he said, will be used for staff development. In order to keep the Fall and Spring semesters within 10 days in length of each other, Hendrix said that it would be necessary to start the Fall semester earlier. Under state law, a district cannot begin classes before the week in which Aug. 21 falls. Crosby ISD would like to begin classes on Aug. 12. Hendrix said that this is not an unusual request and that it would bring Crosby in line with other districts such as Galena Park, Sheldon and Goose Creek, which have opted to reduce student instruction days for staff development. The district is scheduled to have a public hearing on the earlier starting date on March 22, when the board is expected to vote on the issue. If the board approves the waver request, Hendrix said, they should have little problem with TEA signing off as well. Nancy Oliver has served on the Crosby-Huffman Chamber of Commerce Board of Directors since 1996. She was Secretary from 1999 to 2003; chaired the Nominating Committee; and served on many committees including Banquet, Picnic in the Park, Community Clean-up and Economic Development. Nancy co-chaired the Community Center Committee that researched the need and requirements for a community center in Crosby and met with Commissioner Eversole to request the project. Ms. Oliver has been Tax Assessor/ Collector for Crosby Independent School District since 1991, following six years as a commercial appraiser for Harris County Appraisal District, five years as a real estate salesman and broker, and six years as a librarian at Harris County Library. Nancy holds the professional designations of Texas Real Estate Broker, Registered Professional Appraiser, Registered Texas Assessor/Collector, Certified Tax Administrator and Certified School Tax Administrator. She is a member of the Texas Association of Assessing Officers, the Gulf Chapter of TAAO, Institute of Certified Tax Administrators, Texas School Assessors Association, and Institute of Certified School Tax Administrators. She was chosen by the Gulf Coast Chapter of TAAO as the Certified Tax Administrator of the Year in 2003. The Star Courier honored Ms. Oliver in 1996 as a Super Star Citizen of 1996. She serves on the Board of Directors of St. Paul’s United Methodist Church, Baytown. A past president of Baytown Little Theater, she has appeared in several productions, as well as serving as chairman of the make-up for productions and newsletter editor. She is the mother of two grown sons and the proud bragging grandmother of oneyear old granddaughter Avery. CROSBY  An abandoned truck and flatbed trailer which once held the stage used by Janet Jackson and Justin Timberlake and was stolen from Houston was discovered in Crosby last week. Harris County Sheriffs investigators said that a blue 1995 Freightliner truck and flatbed trailer were found in the middle of the road, with the engine running, in the 400 block of McKinney. The truck was traced back to a business on Maxey Road in Houston. The business owner, Lonnie Whitaker, said that the truck held the stage and other equipment from the show valued at $50,000. The stage alone was valued at $25,000, said Whitaker. The case was turned over to Houston PDs Auto Theft Division for investigation. Recently, a posting for an entry stage was posted on the Internet auction site Ebay. LYNCHBURG It was a dark and rainy night, as the story goes. 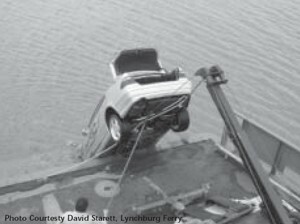 And about 3 a.m., Nora Reyes,21, and a male friends were driving down Lynchburg Road to the Ferry, when they failed to stop at the docks edge, and plunged into the Houston Ship Channel. They were able to escape from the sinking car, with the help of Ferry sailor Jason Farish, who jumped into the water and helped pull them to safety. Officials have charged Reyes with driving while intoxicated, and she was booked into the county jail that night. The male passenger was not held. Each year the Star-Courier is pleased to award its Star Citizen designation to a person who has contributed to the betterment of the community through their interest, commitment and hard work. This year, the nominations were open to the public as well as consideratin by the editorial board of the newspaper. There were a number of nominations, which have been distilled to one from the Crosby/Huffman community, Pat McPhee, and one from the Highlands community, Betty Michalsky. We congratulate both of these outstanding citizens, and thank them for their contributions. Pat McPhee is a financial planner who has represented the Edward Jones brokerage firm for about five years, in the Crosby area. He and his wife Barbara are well known in church, community, and civic affairs as well as having a group of caring and supportive friends. McPhee serves the community on the board of the YMCA in North Shore, and in that function helps to oversee expenditures, fund raising, programs, and administration. He has also been a proponent of a YMCA in Crosby, if the community indicates it will support one. This success includes a life long friend, his wife, whom he went to high school with in Michigan. They came to Houston together in 1974, more or less for the adventure and a change from home. They moved to Crosby in 1978, and raised their daughter Mikele in Crosby schools. Pat says he is blessed to live in a community such as Crosby, and thinks the Crosby school system offers the best education to anyone who will make an effort. Betty Michalsky is a member of Pilot Club of Highlands, and was nominated by several people who are aware of how hard she works for the Highlands community, never stopping from one project to the next. She has been active in the landscaping of the highway at 4 corners (S. Main Street and Interstate 10). She also worked on the landscaping around the gazebo and flagpole at the old railroad station site on San Jacinto and Main Street. She has appeared many times in the columns of the Star-Courier.